Do You Use A Treadmill? Here’s A Prescription! 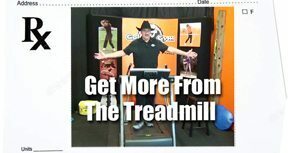 You can enhance your time spent on a treadmill while helping you overall golf game. 1. Start slowly to get balanced and create a rhythm that feels comfortable. 2. Once you are comfortable, start moving your arms front to back, or side to side while staying balanced. 3. Bring the speed up to where you are being slightly challenged. 4. When comfortable add some incline. Incline on the treadmill will definitely raise your heart rate from the greater load being applied. 5. See if you can accomplish about a 10 minute duration. 6. Vary the speed and incline so that you can build up to 15 challenging minutes versus 30 “Ho Hum” minutes. This activity is meant to help you develop some endurance. 7. Change your “gate”, your feet position, your arm movements, and your overall commitment to the process. 1. Do not lean on the arms of the treadmill (unless you need to establish your balance at first). Taking your weight off your feet actually is defeating the purpose of the activity. 2. Do not walk at the same pace and/or incline for extended periods. Variety activates additional stabilizing muscles that will help in developing a solid golf stance and posture. 3. Do not walk so fast that you are out of breath or can’t carry on a conversation…unless you are performing HIIT (High Intensity Interval Training) routines. Your comments would be greatly appreciated. Please leave them below the video on YouTube. I am open to all comments regarding more things to do on the treadmill and on my challenge to get to my goal of 225 pounds.